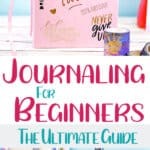 The ultimate journaling guide, easy tips for starting a personal journal in 2019. Keeping a journal sounds really easy, right? Just pop open a notebook and start writing your heart out. Now, for probably 10% of the population, they can do this regularly and consistently. The rest of us 90% need a little more guidance with journaling. Yes, we all probably can grab a blank notebook and write a few pages. Beyond that, however, it gets forgotten about. Intentions removed, the notebook gets tossed in a corner for years… and then we see it, read our few pages, reminisce and say ‘I wish I could have kept it going longer’, maybe get inspired to start up a new one… and the cycle repeats itself. 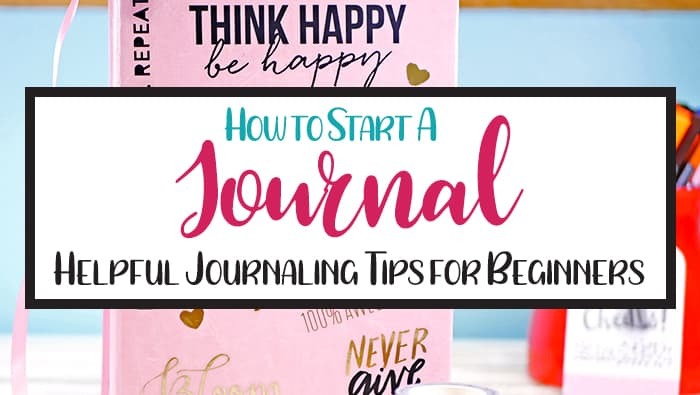 So if you’re ready to learn how to start a journal along with journaling tips that will help you stay successful as a beginner, let’s get started! You may not be aware of this, but there are so many benefits to keeping a journal regularly. 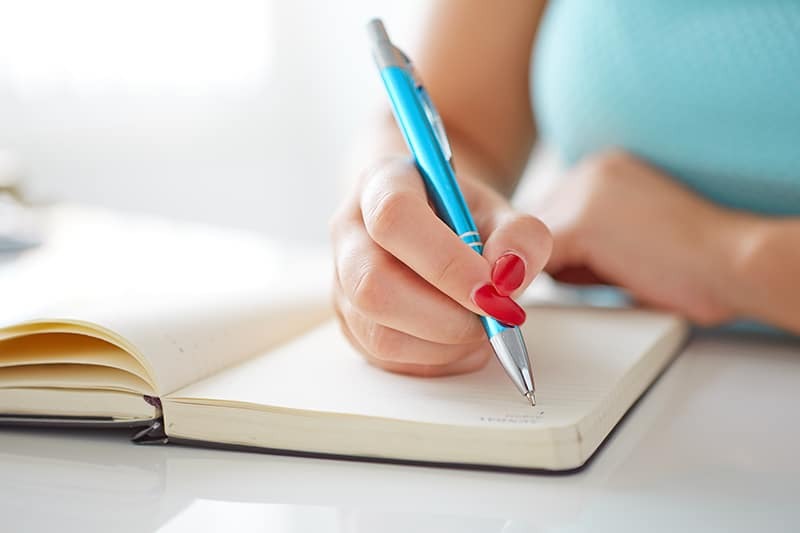 While you don’t always need a reason to write in a journal, it’s good to think about and consider what you hope journaling will help you accomplish. Honestly, journaling isn’t the best solution for every single person. It’s important that your reasons for journaling regularly match your personality, interests, and that it fits into your schedule. Here are some other questions that are good to consider to help you find your why for journaling. What do I hope to accomplish by keeping a journal? How much time do I have to journal every day? What do I want to write about in my journal? Which types of journals interest me? The nice thing about traditional journaling is that you don’t have to have a lot of complicated items to start. But a lot of people who journal regularly really enjoy investing in quality supplies that make their experience more fun and personal. Here are some amazing, quality journaling products that many people utilize for their journaling experience. A good journaling notebook will allow you to write easily without the paper bleeding or tearing from writing. While many standard notebooks will get the job done, here are some excellent options to consider for journal notebooks. A good pen for journaling will write smoothly with minimal smear. Thankfully, there are a lot of great pen options for all people, including ballpoint, gel, and fineliner style pens. The nibs, or the writing point of the pen, come in all sizes so you can easily find the style suitable for you. Personally, one of my favorite journaling pens is the Pilot Frixion pen. This incredible pen style comes in many different colors and nib styles, not to mention writes very smoothly. However, what sets this pen apart from other journaling pens is that you can erase mistakes with this pen. These options typically fix small mistakes as if they never happened. 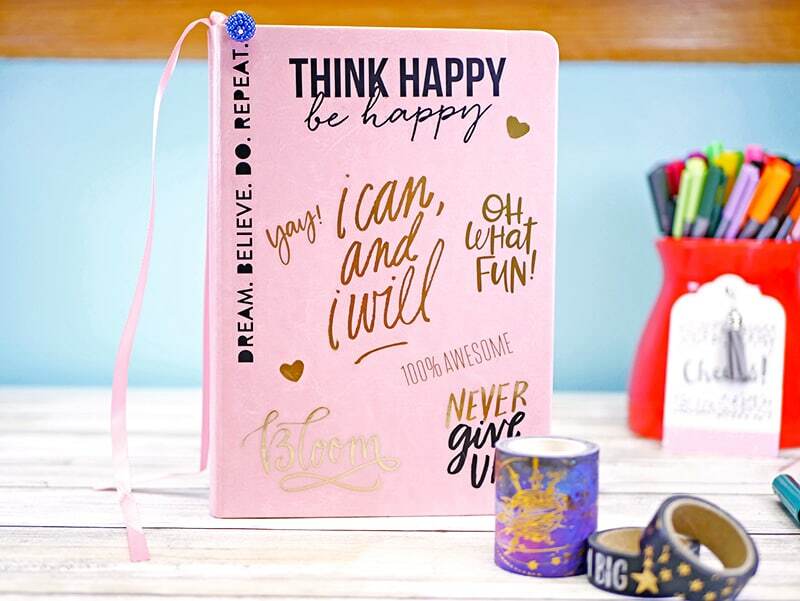 Beyond the traditional tools for journaling, there are some other supplies that are a lot of fun which can help add personality and style to your journal. Some people may enjoy the creativity and freedom you can have with a journal. The opportunity to write about anything and everything is exhilarating for certain types of people! For other people though, their ‘why’ may indicate a need for journaling to help fill a specific need. 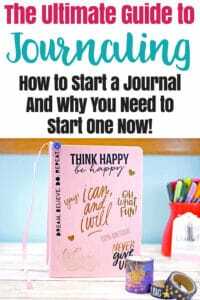 Luckily, there are many different types of journals that exist in the world to help people who need a little more focus when it comes to creating the journaling habit. 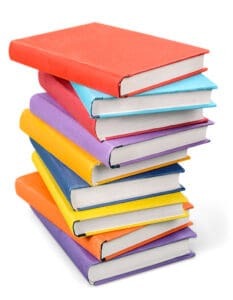 If you want a more thorough overview of the different types of journals that exist, I would highly encourage you to read this blog post about different types of journals. For now, I will go ahead and provide a brief description of what each type of journal accomplishes. I’ll also add some helpful journal recommendations for each type of journaling. Are you looking at how to journal for mental health benefits? A journal is an incredible way to help increase confidence and self-awareness while reducing symptoms of stress and anxiety. There are numerous studies like this one that show the incredible mental health benefits of journaling. 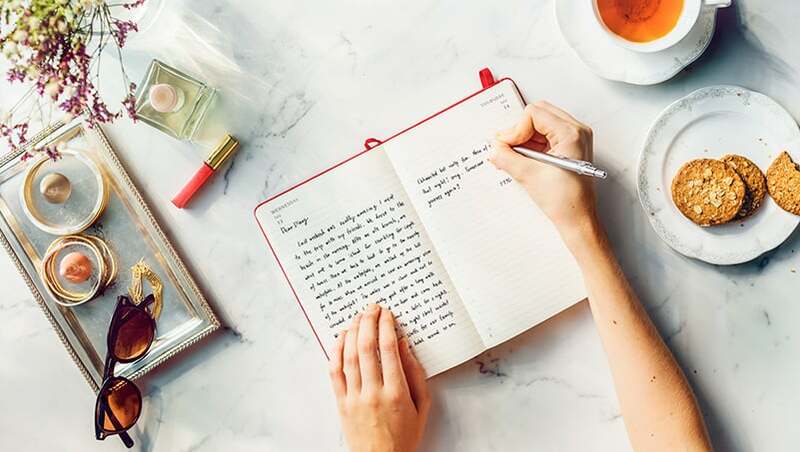 If you’re ready to get started journaling to improve mental health, here are some incredible guided journal options you will want to check out. Bible journals are unique in that the journaling actually happens within a bible (or another book of prayer, if that’s permitted within your religion). 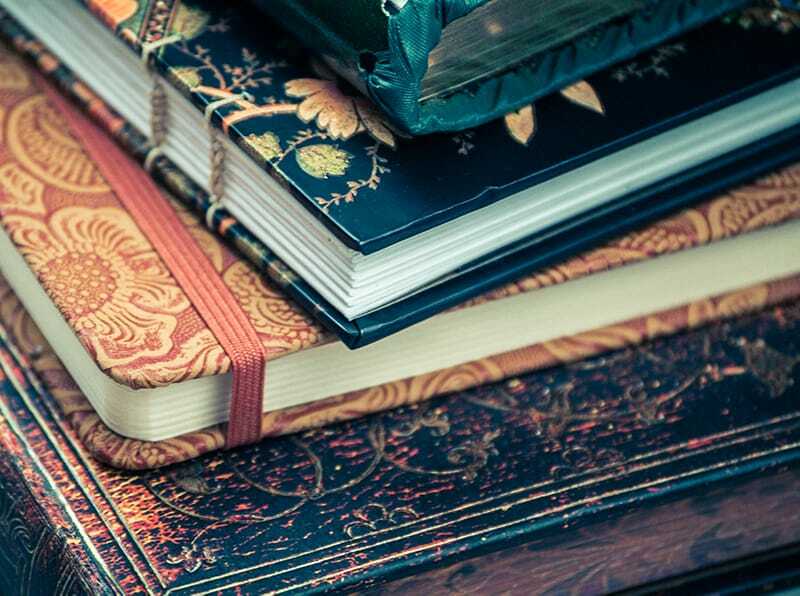 Here are some recommended bibles that are perfect for journaling. New to bible journaling? Learn how to start a bible journal here! Prayer journals provide a safe place to write down prayers about anything. These types of journals can be done in a plain notebook if you feel confident in using your own prompts and guidelines to write. If you’re a long time visitor to my blog, you are fully aware that I am a huge advocate for bullet journals. Bullet journals are more of a DIY planner option, though a lot of people do combine journaling into their bullet journal structures. While many people prefer to set up their bullet journals by hand, people who enjoy the concept but don’t have the time to create have some opportunities. Here are some tools and printables that are perfect for people who want to explore journaling in their bullet journals. Ready to get started? Here are some of the supplies that are must haves for my own bullet journal. A good pen is a necessity for bullet journaling. Here are some of the top-rated pens that people love in the bullet journal community! If you love the idea of decorating and drawing in your bullet journal, you’ll definitely want to pick up these markers. This is literally just brushing the surface on everything you can purchase for your bullet journal. 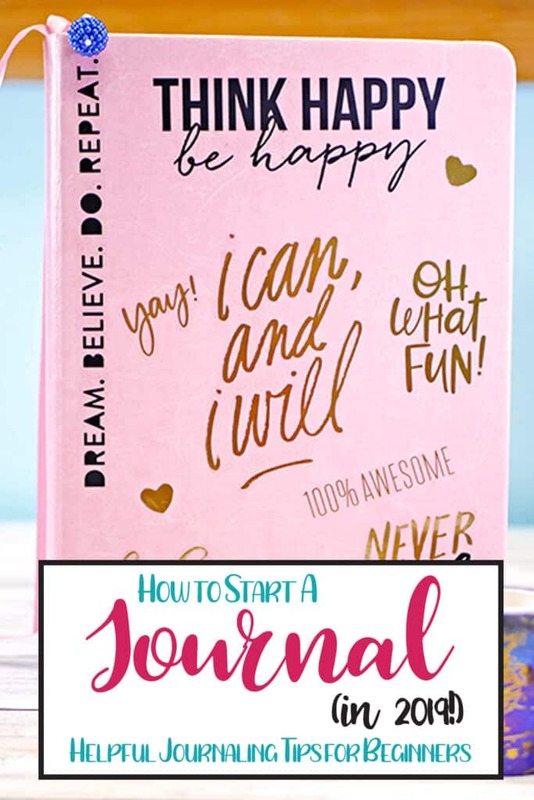 Make sure to read my How to Start a Bullet Journal Guide to learn more about awesome supplies, as well as my Bullet Journal One Stop Shop Guide for other great ideas bullet journalists love that you can find all on Amazon! A pregnancy journal is a great way to record information in regard to everything about your pregnancy. You can log your symptoms, your changes, you reactions to discovering when you were pregnant, your hopes for the future, and anything else you want to remember in your journey. You can even utilize a pregnancy journal for the first weeks of postpartum, as well, by logging feedings, diaper changes, firsts, emotions, and more. Art journals or junk journals are fun ways to express your creative side while journaling. It’s up to you whether you choose to write as well as create art, but some people find painting, doodling, and sketching a better way to journal overall. If you think about a scrapbook, in a way it’s a type of journal that shares written experiences with pictures and flat memorabilia. When you look at a scrapbook, you’re looking at the story of what somebody went through in their life from their own eyes. Idea journals are a perfect journaling option for writers, artists, students, research, or even people who work from home and need extra encouragement. Dream journals are a little bit more unusual because rather than writing out ideas, goals, desires, or past events, this type of journal is about tracking your dreams. Beyond dream tracking however, this helpful type of journal can also help you discover more about your sleep health. Food journals are more concrete than other types of journals as you log your food and drink intake into this type of notebook. While this type of journaling may not help you dig down your deepest desires, food journaling can help you become more mindful of what you are consuming on a daily basis. Not to mention, the big benefit is that there are studies like this one that shows journaling your food intake can actually play a beneficial role in helping you to lose weight. As you can see, there are dozens of different types of journals beyond the traditional notebook. 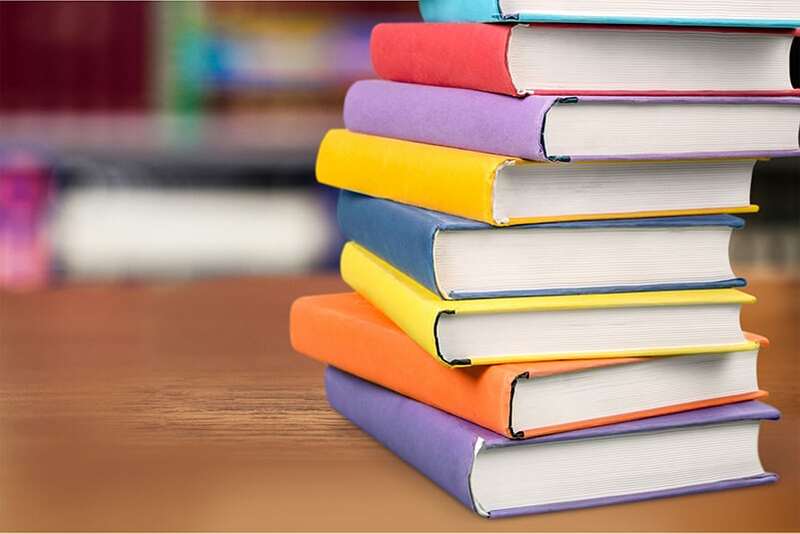 What you choose will be up to you and your preferences, but hopefully, this guide has helped you figure out which type of journal best suits your needs. Now, let’s get started working on your journal! How you start your journal will be customized based on your needs. However, here is a quick, helpful video that talks about the process of starting your first (or next) journal. 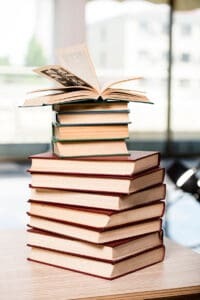 While these points aren’t necessarily specific prompts, you’ll notice that you can write about so many different types of topics and stories relating to each idea. If you decide that writing about general topics is not specific enough to get you going, I would highly recommend looking at journaling prompts. Journaling prompts still puts the control in your hands over what you choose to write. These types of prompts don’t necessarily revolve around specific concepts or themes like the ones mentioned above. That said, you can either choose to follow a guided prompt challenge or have a list you can pick and choose from. Additionally, you can create your own guided journal by using the same type of guided prompt for journaling every day. 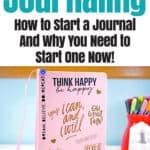 This type of DIY guided journaling option is great for me because it helps me to boost my self-esteem, think of others, and think out my task list for the day. After learning about literally everything you could learn about journals, now is the part where we make journaling part of your daily routine. Journaling as a hobby is very easy to establish, so here are a few tips to help you get started. One of the best ways you can establish the journaling habit is to journal at the same time every single day. Pick a time of day where you know you have the time to devote to writing for at least a few minutes. Personally, I love journaling as part of my miracle morning. But some people may prefer to journal at work or journal before bedtime. There is no right or wrong answer, but if you have the ability to pick a consistent time to journal, this can really help you to establish the habit faster. Sometimes, based on your schedule, journaling at the same time every single day just isn’t going to work. It’s ok, and that it is important to be realistic. The journaling habit doesn’t have to be big nor overly complicated. Writing for five minutes a day is a great way to establish a routine that isn’t overwhelming. You can find five minutes a day right? You can even buy a cute little case so you can bring your journal and supplies with you anywhere, so if you need to write on the bus, or at work, you have that option easily available. Want another journal hack related to this tip? Use a timer! Set it for five minutes to journal and write until it goes off. Don’t have one? Your watch or smartphone likely has a timer app already installed, or you can buy a small pocket timer for journaling here. If you have a guided journal, this isn’t a point you have to worry about as much since your prompts are laid out in front of you. But if you don’t have a guided journal, sometimes trying to figure out what you want to write about can actually prevent you from writing effectively. Having a list of prompts you’d like to write can be extraordinarily helpful if you aren’t coming up with ideas on your own. When you are feeling a bit more inspired, I’d recommend writing out a list of potential prompt ideas to select in a page at the back of your journal. If you do choose to journal at a consistent time daily, take some of the guesswork out of writing by setting alarms and reminders to help prompt you when it’s time to write. I would only recommend this suggestion if you are able to keep your journaling commitment at the same time regularly. Personally, I find that over time I tend to ignore reminders if they are vague and not-specific. But if you do have a specific time to journal, an alarm will serve as a very helpful reminder to get started. Generally listening to calm, quiet music is perfectly fine while journaling, but it’s critical that your journaling zone is a place free of distraction. This means no journaling while watching shows, no journaling with kids running around, and keep your phone away from you. Journaling time should be considered a sacred time and you shouldn’t have to worry about anything else beyond your writing. And if finding quiet is hard (I’m a parent, I know how it goes! ), a good pair of noise-canceling headphones will become your best friend for journaling. If you are pretty good about keeping your items secure, why not carry your journal with you? I did this frequently with my bullet journal and it made it very easy to keep it updated on a regular basis. Then, while you’re out and about, you can pull your journal out if you need it. By the way, I love this backpack for carrying all of my bullet journal supplies. It’s literally perfect because it can hold everything else, including my laptop and a plethora of other supplies I carry with me daily! When people think of journaling, I think it’s easy to think of these super long journal entries that are multiple pages in length. Why does journaling have to be that difficult? Journal entries don’t have to be very long! I’d be intimidated if I were expecting to write multiple pages every single time I sit down to write. If you are dreading the concept of writing an entire page for every prompt, start with a smaller goal. For instance, for the first month, get in the habit by starting with five sentences. You can always write more if you want to, but you know you can stop after you finish those particular sentences. Journaling doesn’t have to be boring and serious. Have fun! I recommended a lot of great ways to spice up your journal and personalize it to fit your needs. 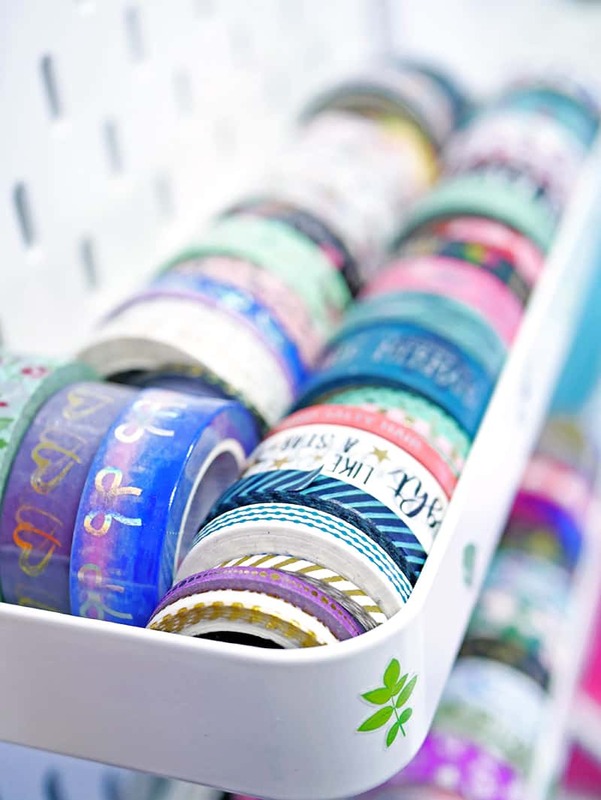 Don’t be afraid to use fun pens, stickers, washi tape, markers, and other accessories to personalize your journal. 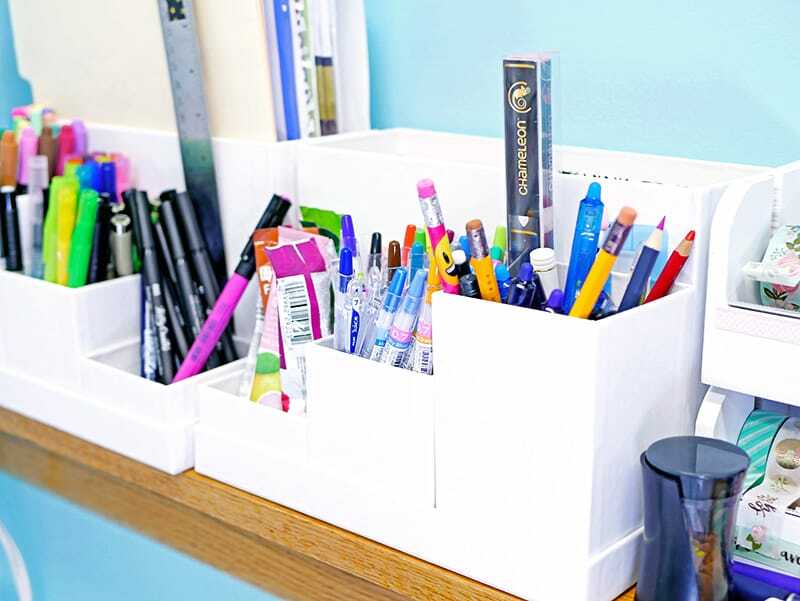 You can also select cute notebooks, fun covers, and adorable pen holders to make the journaling process more interesting and engaging. Here are a few things to keep in mind when writing in a journal. For some, these tips may seem obvious and straightforward. Yet for people who struggle with motivation, perfectionism, or even getting started, these tips will help you to overcome potential barriers while writing. The last tip is probably the most important. If you’re stuck for a way to finish a journal entry, that is OK! You can even write that you ran out of ideas on how to finish the post. Also, if you’re not sure what a brain dump is, you’ll find out very shortly. Some people love the concept of journaling but think they can’t journal because they aren’t very good at writing. I believe there is a lot of misconceptions that journaling means you have to fill an entire page with juicy details and secrets. That style of writing isn’t for everybody. A lot of people don’t think about art when it comes to drawing, but many of us drew in our journals when we were children in school. Just because we’re grown up doesn’t mean we have to abandon that habit! If drawing helps you tell a story, explain a concept, or express your emotions better than words could, keeping a drawing journal is just fine. Journaling doesn’t have to be pretty flowery sentences. Journaling can be writing down a sequence of events. Your grocery list. Your meal plan. It can even be a to-do list. For people who need to work through issues, writing pros and cons can be a more structured way to journal. Though it’s much less abstract than most types of journal writing, you can get creative in how you look at pros and cons. A brain type of a very abstract type of journaling where you jot down anything you want to write down. This could be an idea, a typical journal entry, a poem, doodles, an email address, a reminder, even song lyrics- what’s beautiful is that there are no expectations when it comes to a brain dump. Read more about how to set up a brain dump here! While this is a little different from traditional journaling prompts that provide different ideas for journaling every day, this type of prompt is more like a consistent summary. The beautiful thing about this type of journaling is that while the prompts are always the same, the answers will vary from day-to-day. Sure, you’ll probably write some types of similar content (I’d say I’m grateful for coffee at least 5 days a month), but sometimes my answers surprise me when I go back to read what I wrote. Want to learn more about Miracle Morning? Get your copy of Miracle Morning by Hal Elrod here! So, you’ve started journaling, and everything is happy sunshine and unicorns, right? Now, not that this is meant to scare you away from journaling by any means! 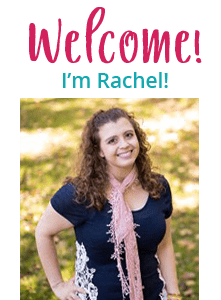 But since my page is called ‘Planning Mindfully’, one of the things I like to make my readers aware of are some of the pitfalls and frustrations that people may come across as they begin their journaling journeys. There will be plenty of people who experience ease while starting their journals, while others may come across some or all of these scenarios listed below. I think the other misconception many people have when you start journaling is that it’s supposed to look like a happy field of flowers, where you feel 100% better as soon as you write it out on paper. Journaling can actually surface up some intense emotions. You may experience moments of anger or sadness when writing. On the flip side, you may experience extreme feelings of gratitude and joy. You think you’re going to sit down and write a full page… but then you only write three sentences. What gives? Isn’t this supposed to be easy? Depending on the subject matter you’re writing about, that can also prove to be challenging. If you’re writing about a prompt that is difficult to express, or working on a prompt that isn’t very interesting, you may feel like getting out more than a couple of sentences is really tough. All of this is very normal to experience. If you aren’t able to write more than a few sentences because you don’t like the prompt, it’s emotionally triggering, or you just don’t feel like writing, you don’t have to torture yourself trying to write pages upon pages in your journal. 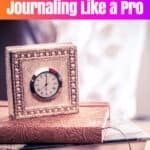 People don’t really think about journaling as being a skill to practice and improve on. Journaling is challenging at first because it isn’t a regular habit that you’ve established. All of a sudden you’re going from writing little to nothing in a day to writing, well, more than that. Most activities you try for the first time, or even come back to after a long hiatus… it takes some time to get comfortable with writing again. My advice is to just keep writing and keep trying. If you can’t go past a few sentences, that’s ok! Try again tomorrow. Having used a bullet journal for a long time, I can say pretty confidently that making mistakes in your notebook is going to be a regular experience. For my journal entry sections, I’ve actually been scribbling out brief mistakes and then I continue writing. While nobody is ever able to prevent mistakes, these tools can help hide mistakes so they won’t bother you nearly as much. Missed a day in your journal? Or a week? What if you missed a whole month or an entire year? Life can be funny sometimes, you know? It’s so good at throwing a zillion curveballs that distract us and keep us away from the things we intend to do on a regular basis. That said, there is no reason to allow that to cause us to feel guilt. We all experience it. You don’t have to let it serve as an excuse to never journal again. That’s the beauty of most journals, too. Just flip to the next page and keep writing. It probably won’t be easy to restart, but trust me, you’ll thank me later. Hopefully, this post got you completely ready and inspired to start writing in your very first journal! While this post may seem surprisingly long for something as simple as writing in a notebook regularly, I like to think of journaling as a long term game. And the last thing I want is for you to get inspired to start, to only throw your notebook in a pile a week later and forget about it. I’ve done it! I don’t desire for you to repeat that particular scenario, you know? 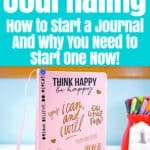 I’d love to know why you hope you start a journal in the comments! What do you hope that a journal will help you accomplish?